Friends, families and colleagues kick-off new self-guided Trail Challenge on National Trails Day, Saturday, June 1! WHAT: Tahoe Rim Trail Challenge. The Tahoe Rim Trail Association (TRTA) has selected six scenic points on the Tahoe Rim Trail. Participants will hike, bike, snowshoe, ski or ride horseback to each of the destinations and receive invitations to select experiences designed exclusively for Trail Challenge members in 2013. WHERE: Tahoe Rim Trail. Official kick off location is Van Sickle Bi-State Park in Stateline, NV on National Trails Day, Saturday, June 1. Registration begins on Wednesday, May 15 at tahoerimtrail.org. Incline Village, NV - Do wildflowers and snow capped mountain peaks leave you breathless? Do you love incredible Lake Tahoe vistas? Then step up to Tahoe’s next big adventure: The inaugural Tahoe Rim Trail Challenge benefitting all participants and the Tahoe Rim Trail Association. “The Trail Challenge is a program for current and new Tahoe Rim Trail Association members. 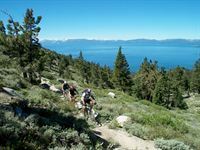 It is a fun way to experience select portions of the 165-mile Tahoe Rim Trail while supporting the TRTA,” shares Mary Bennington, TRTA’s Executive Director. “Once you register, the adventure begins! The Tahoe Rim Trail Challenge is a family-friendly and healthy way to create lasting memories while having fun hiking, biking or horseback riding this summer,” explains Kristine Mitchell, TRTA’s vice president of trail use. TRTA has selected six premier destinations on the Tahoe Rim Trail. Participants register for the Trail Challenge online at tahoerimtrail.org and strive to experience all six destinations by the end of 2013. Participants hike, ride horseback, mountain bike, snowshoe, ski or use a combination of methods with friends, family members or on their own to complete the challenge. All participants will receive an inaugural Trail Challenge T-shirt and access to everything related to the program including exclusive admission to the members-only website where people will track achievements, share pictures as well as access GPS waypoints for the six destinations. The program cost is $55 which includes all of the benefits of the Trail Challenge plus an individual annual TRTA membership. Current TRTA members can register for just $20. Visit tahoerimtrail.org for more information about the inaugural Tahoe Rim Trail Challenge. To date, Tahoe Rim Trail Challenge media sponsors include 101.5 and The Weekly. Established in 1981, the Tahoe Rim Trail Association is a membership-supported organization that maintains and enhances the Tahoe Rim Trail, a trail like no other™. TRTA exists to practice and inspire stewardship, promote access to the beauty of the Lake Tahoe region and sustain the Tahoe Rim Trail system. We operate two overarching programs: Trail Operations and Trail Use. Both programs offer in-depth trainings and rewarding volunteer opportunities. TRTA recruits, trains and manages approximately 1,000 volunteers who contribute more than 17,000 hours annually to support TRTA’s mission. Volunteer efforts, individual and corporate donations and grant funding make TRTA’s annual stewardship work and more than one hundred free public offerings possible. Visit http://www.tahoerimtrail.org. NC Communications leverages solid relationships with media and builds new ones to spread the word about our clients' businesses. In addition to media outreach and relations, we listen to business goals, write custom content for feature articles, web sites, blogs and social media. Visit nicolecheslock.com. TRTA exists to practice and inspire stewardship, promote access to the beauty of the Lake Tahoe region and sustain the Tahoe Rim Trail system. 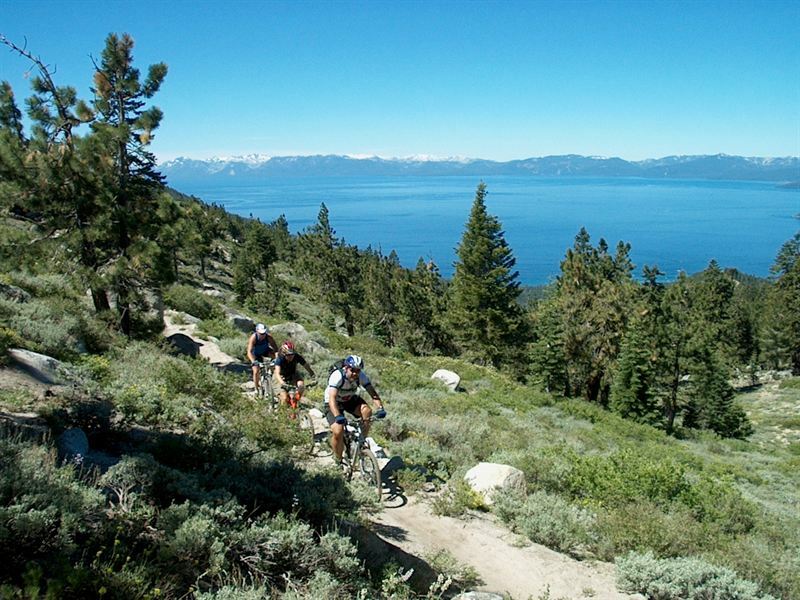 TRTA has selected six premier destinations on the Tahoe Rim Trail. Participants register for the Trail Challenge online at tahoerimtrail.org and strive to experience all six destinations by the end of 2013. Participants hike, ride horseback, mountain bike, snowshoe, ski or use a combination of methods with friends, family members or on their own to complete the challenge. All participants will receive an inaugural Trail Challenge T-shirt and access to everything related to the program including exclusive admission to the members-only website where people will track achievements, share pictures as well as access GPS waypoints for the six destinations.